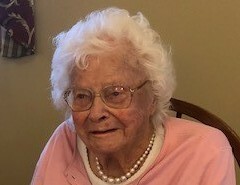 Obituary for Leona D. (DeVries) Doehler | Williamson Funeral Homes, Ltd.
Leona D. Doehler, 99 of Staunton, IL passed away Saturday, March 23, 2019 at Heritage Health in Staunton. Born July 12, 1919 in Staunton, she was a daughter of the late Mr. & Mrs. William & Ida (Hunecke) DeVries. She married Wilbert Meyer and he preceded her in death in August of 1944. She later married Clarence Doehler on June 14, 1952 and he passed away December 26, 2003. Leona was a homemaker and was very active member of Zion Lutheran Church in Staunton. She is survived by her Daughter-in-Law, Sharrie Meyer of Mt. Olive, IL; 2 Granddaughters, Debra (Steve) Buchanan of Worden, IL and Patrice Miller of Millersville, MO; 2 Great Grandchildren, David Buchanan & Allicia Klostermann; 3 Great Great Grandchildren, Melaney, Zander, and Camille. Many nieces and nephews also survive. Besides her husbands and parents, she was preceded in death by 1 Son, Delmar Meyer; 1 Grandson-in-Law, Warren Miller, and 1 Brother, Lawrence DeVries. Friends may call from 6 to 8 PM on Tuesday at Williamson Funeral Home in Staunton. Funeral services will be held Wednesday, March 27, 2019 at 10:00 AM at Zion Lutheran Church in Staunton with Rev. Kelly Mitteis officiating. Burial will be held at Spangle Cemetery near Livingston, IL. Memorials are suggested to Zion Lutheran Church of Staunton.